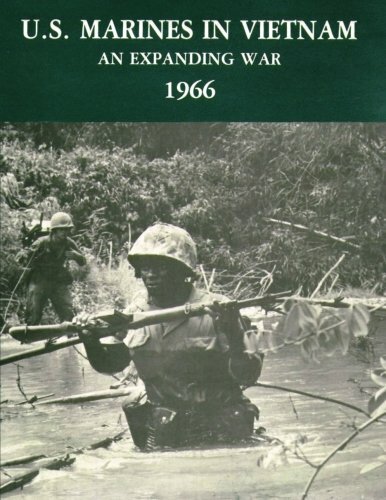 This is the third volume in a planned 10-volume operational and chronological series covering the Marine Corps' participation in the Vietnam War. A separate topical series will complement the operational histories. This particular volume details the continue d buildup in 1966 of the III Marine Amphibious Force in South Vietnam's northernmost corps area, I Corps, and the accelerated tempo of fighting during the year . The result was an "expanding war." The III Marine Amphibious Force had established three enclaves in I Corps during 1965. Employing what they believed was a balanced strategy-base defense, offensive operations, and pacification-the Marines planned to consolidate their base areas in 1966. At the beginning of 1966, the 1st Marine Division reinforced the 3d Marine Division and 1st Marine Aircraft Wing in Vietnam. By the end of the year, the III Marine Amphibious Force had nearly doubled in size. Two separate events, however, were to dash the high hopes held by the Marines in 1966. An internal political crisis in the spring halted the Marine pacification campaign south of the large Da Nang Airbase. In July, the North Vietnamese Army launched an incursion through the Demilitarized Zone and Marines went north to counter the enemy thrust. By December 1966, Marine units were stretched thin along the 265-mile length of I Corps. As one Marine commander observed, "too much real estate-do not have enough men." Although written from the perspective of III MAF and the ground war in I Corps, the volume treats the activities of Marine advisors to the South Vietnamese Armed Forces, the Seventh Fleet Special Landing Force, and Marines on the staff of the U .S. Military Assistance Command, Vietnam, in Saigon.